Mott The Hoople’s fans were two miles from heaven! Young dudes, old dudes, Hott Motts, and glam girls were in for a treat. After 35 years of failed attempts and false rumours, the reunion was finally on – five nights at the legendary Hammersmith Odeon (or whatever it’s called now)! This was the site of Mott’s infamous live album recording in 1973, and the same venue where they played two shows on the same day due to overwhelming ticket demand, to a ravenous crowd resulting in the headline, “Mott Riot!” As far as we know, they are still banned from the Royal Albert Hall. Tickets for the fantasy went on sale nine months in advance, giving us plenty of time to excitedly anticipate which songs they might perform, and how great it would be. Despite the unnerving response of ‘Mott the What?” whenever I’d cite them to anyone who asked what my favourite band was, the first two scheduled shows sold out in just a few hours, and three more gigs were added – the ultimate testament to my venerable good taste! Any truly worthy and inspiring band will get its deserved accolades. It’s only a matter of time. Back then, it was wild – all flash and then crash. 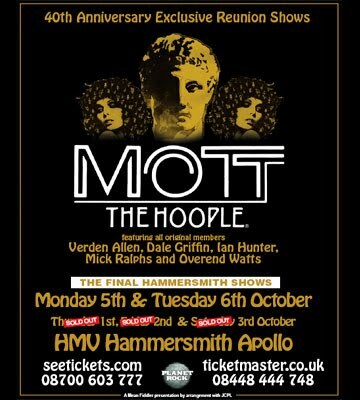 Mott’s live gigs always outsold and out-did their albums. They broke up in 1975, when I was sixteen. Seeing all five gigs now would perhaps make up for that. We all know that the band was not reuniting just for themselves – but also for us kids – us BIG OLD KIDS! Mott had a unique solidarity with their fans. They even wrote rockers, ballads and hymns to, for and about us. On their quest to become superstars, they never looked down upon us. They came from the same places that we did, and hated the same things we hated. Mott fans were an extremely loyal bunch, traveling far and wide to all the gigs. Mott gave their fans equal credit for their success. Now, after thirty-five years, this was the biggest ‘thank you’ that they could ever give us. The front stalls were filled with the old Seadivers (Mott fan club members) who cried upon hearing the goodbyes in the fadeout of the Hooples’ final single, ‘Saturday Gigs’ in 1975, which heralded the band’s breakup. Here we sat, as if in a dream, at our own long awaited Saturday gig – which followed up the Thursday and Friday gigs! The five original guys; Verden (Phally) Allen, with his vintage Hammond organ, Ian Hunter with a brand new Maltese Cross guitar (a gift from Def Leppard’s Joe Elliott), Mick Ralphs and Pete Overend Watts, with his Thunderbird bass, stood before us like a strange hallucination. The Pretenders’ Martin Chambers handled the drums for the frail Dale (Buffin) Griffin, whom despite his ill health, played on the encores to wild and loving cheers. The reunion was now complete. Another reality check – was this really happening?! After the traditional ‘Jupiter’ intro music played, and a few more pinches to confirm that we were really here in this actual, unbelievable moment, Mott The Hoople launched into ‘Hymn For The Dudes’. Gone were ‘the suits and the platform boots’ but otherwise, it was business as usual! Alternating between ballads and mad rockers, as always, Mott persevered for two full hours! The crowd remained standing throughout, and Hunter remarked that this was the first time Mott had a standing ovation for their entire show! There is truly something special about Mott The Hoople! Ian Hunter was no longer a solo artist. He was a Dude once again – glowing from the inspirational camaraderie of his dear old mates – acting as the superstar he’s always been. As he shook hands with fans in the front row, he remarked to the band, “I know all of them!” He even dedicated a song to a UK fan Andy Sibson, who recently passed away. Mott The Hoople re-lived their former glory, as each member’s personality and chops fully emerged. Overend (after a 20 year musical hiatus, due to a passion for fishing and cross-country walks) stomped, prowled and stalked the stage, physically interacting with the fanatically chuffed crowd. His bass playing was incredible, and he almost stole the show – especially during “Born Late ’58’! Mick Ralphs played some really sweet licks, and came alive onstage much more than expected. Phally propelled the whole thing with his vintage Hammond organ, the signature sound of Mott. It was amazing to see the big old cabinet up there with the Leslie speakers – just like old times! Drummer Martin Chambers powered the band throughout, and supported Buffin during the encores. Buffin got better and stronger each night, and he was as happy to be there, as we were honoured to see him. Two large video screens simultaneously illustrated old photos and news clippings of the band, and the iconic imagery of The Hoople album cover, bearing the face of model Kari-Ann with all the Hooples in her hair, which served as a fantastic backdrop. Hunter broke into some old Dylan, Jerry Lee Lewis and Hank Williams songs on the keyboard. The backing choir grew as the nights went on, to include several Mott kids; Ian Hunter’s son and daughter Jesse and Tracie, Mick Ralphs’ son Jim, Mick Ronson’s daughter Lisa, and another old pal, the original singer of Mott The Hoople whom Hunter replaced ages ago, Stan Tippins. Mott superfan Joe Elliott appeared on “All The Young Dudes”. The bittersweet finale was ‘Saturday Gigs’, the Hooples’ 1975 farewell single chronicling the history of the band, from the 1969 Roundhouse gigs to their final 1974 Broadway shows in New York City. Video screens showed nostalgic slides of rare Mott gig posters and handbills. The band poignantly put down their instruments at the song’s end, chanting the ‘goodbye’ coda acapella, as the lights went down. Mott exited the stage, as the joyful yet tearful crowd carried on chanting ‘goo-ood byyye’, echoing through the hall. That was it – victorious, happy and glorious. Their mentor, Guy Stevens would have been proud. Mott’s STILL got it! Backstage visitors included Jimmy Page, Brian May, Mick Jones of the Clash, members of Duran Duran, Mott’s latter day keyboardist Morgan Fisher, and the original Mott fan club president, Kris Needs, who recently revealed that a young Benazir Bhutto had been a member when she was a young student at Oxford. …Playing some goodies And some newies And some oldies And some filthies And some weirdies And some queeries Just for you! Hey Madeline, your Klaus Nomi page is gone. email me at madelinex@mac.com if this link doesn’t work for you.